We’re 4 games into the Champions League with plenty still to fight for in Europe’s elite competition. We’re four games into the UEFA Champions League with matchday five promising to be a thrilling round of entertaining action. Group B seems to be settled with Paris Saint-Germain and Bayern Munich already through to the Round of 16, while English heavyweights, Manchester City and Tottenham, are the only other sides through to the knockout stages. There’s plenty still to fight for in Europe’s elite competition, so let’s get straight into it! Spartak Moscow kick-start the fifth round of the group stages when they host Maribor in Tuesday’s early kick-off. With Sevilla and Liverpool expected to complete the top two in Group E, Spartak will ensure third spot if they draw the match. The hosts have been exceptional at home, holding Liverpool to a 1-1 stalemate and then going on to beat Sevilla 5-1. Back Spartak on the Half-time/Full-time market at 15/20. Sevilla and Liverpool will be gunning for a spot in the next round as they do battle at the Ramon Sanchez Pizjuan this coming Tuesday. A win for either side will see them through to the Round of 16. The Reds are just a point above Sevilla and could even qualify with a draw, should Spartak lose. Both teams thrive on attacking football and I’m expecting a similar showcase to the reverse fixture, which ended 2-2. Get on the Over 2.5 Goals market at 7/10 and include in all your midweek multiples. Napoli will be hoping to keep their hopes of qualification alive when they host Shakhtar Donetsk. The visitors will march on to the Round of 16 if they can just avoid defeat, while the Naples have to win to stand any chance of qualification. Napoli will be hoping to avenge that 2-1 defeat at Shakhtar, and with the players they have at their disposal, it’s certainly possible. Back the hosts to Score First & Win at 7/10! High-flying Manchester City will be looking to seal top spot in Group F with a win over Feyenoord. Pep Guardiola’s men have been emphatic this season, in all competitions, and are rightfully one of the favourites to lift the Champions League trophy at the end of the campaign. Feyenoord have no chance of reaching the next round of the competition and can only hope for Europa League football at best. City came out 4-0 victors in their last meeting and this tie should be no different. Back the hosts to Win Both Halves at 13/20. Group G leaders, Besiktas, will be pushing to seal top spot if they could just manage a draw against FC Porto. The visitors will qualify if they claim maximum points and Leipzig fail to win. Both teams will be hoping for Leipzig to lose, because if they do, Besiktas will be through, regardless of the result in this match. Besiktas are the only team unbeaten in the group and the fact that they’re priced up as outsiders for the clash baffles me. They won the reverse fixture 3-1 in Portugal and are tipped on the Win/Draw Double Chance at 9/20. Monaco will be pushing for a spot in the top two when they host Leipzig on Tuesday. The French champions have to win to keep their hopes alive of qualification, but will also need Porto not to win at Besiktas. Leipzig will be out of contention for a top-two finish if they do not win and Porto do. These sides played out to a 1-1 draw in Germany and I get the feeling that home advantage could work in favour of Monaco and their chances of qualification. Back the home win at 5/4! Borussia Dortmund face an uphill battle from here on, as they have to win against Tottenham, who have already qualified, while hoping that APOEL Nicosia can get something from their tie against Real Madrid. Spurs could seal top spot with a win, or if they match Madrid’s result. Mauricio Pochettino’s men claimed an emphatic 3-1 win at Wembley the last time these sides met and I’m expecting another goal fest. Take Both Teams to Score at 5/10; another one for all those midweek multiples. We wrap up Tuesday’s action with APOEL Nicosia hosting champions, Real Madrid. Many expected the hosts to be out of contention coming into matchday five, but after two draws against Dortmund, APOEL find themselves with a slim chance of qualification. However, all Madrid need to do to ensure qualification is just win the match and not worry about results elsewhere. Zinedine Zidane’s men claimed a 3-0 victory last time out and are expected to repeat the same sort of result. Back the visitors to Win to Nil at 9/10. CSKA Moscow will host Benfica in one of two early kick-offs on Wednesday night. The hosts cannot qualify on matchday five, but a win would certainly keep them in the running as Basel play Manchester United. Benfica have no points to boast about, suffering four defeats from as many games in the group. CSKA won 2-1 in Portugal and are tipped to make home advantage count here – get on at even money! Second-placed Basel will be looking to do what no side has done so far in the Champions League and take points off Manchester United. The Red Devils have won all four of their group matches and will qualify as leaders with a draw. The Swiss champions will qualify if they win and CSKA Moscow lose, due to their head-to-head record over the Russian side. The reverse fixture ended 3-0 in favour of United, and I’m expecting Jose Mourinho’s men to top the group with a win here! Anderlecht can only hope for third spot when they host Bayern Munich at the Constant Vanden Stock Stadium. The Belgian side find themselves rooted to the bottom with zero points from their four matches. Bayern Munich are already through, but anything less than victory and their chances of finishing first become even slimmer. The Bundesliga giants won 3-0 at home, and have been superb since the reappointment of Jupp Heynckes. The away win is an absolute gift at 3/10, get on! Paris Saint-Germain are one of four teams already through to the next round of the UEFA Champions League, and honestly speaking, they’ve been the most impressive. PSG have won all four of their games, scoring 17 goals without conceding. Celtic, who are currently on three points, will secure third spot if they just better Anderlecht’s result. With PSG already through to the next round, I’m backing Celtic to get on the scoresheet here. Take Both Teams to Score at 8/10! Chelsea hope to book their place in the knockout stages of the Champions League when they travel to Azerbaijan to take on Qarabag. The Blues will go through with a win over Qarabag, but could also advance to the next round if they draw and Atletico do not beat Roma. Chelsea smashed Qarabag 6-0 in their last meeting, and with qualification on the line, I can only see one winner. At 4/10, Chelsea are a great bet – another one for the multiples! Atletico Madrid, who are still in search of their first win of the campaign, look to keep their hopes of qualifying alive when they host Roma on Wednesday. Diego Simeone’s charges remain in contention with a win, or with a draw if Chelsea lose. These sides played out to a goalless draw in the reverse tie, and a repeat of that result will see Roma through to the next round. If the Italian giants win and Chelsea don’t, then they would seal top spot. This match could go either way, so I’d suggest playing it safe and back Both Teams to Score at 9/10. After Juventus knocked Barcelona out of the Champions League last season, the Blaugrana got their revenge when they beat the Old Lady 3-0 on matchday one. 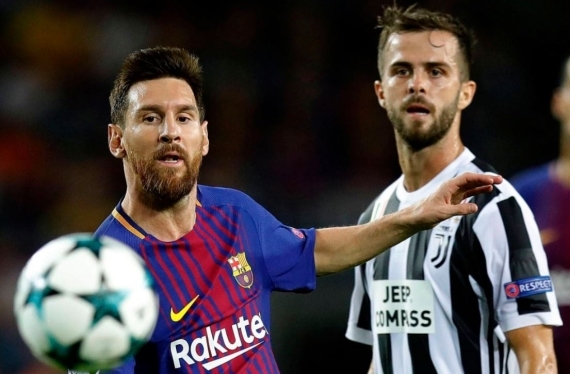 Now, Juve have another shot at vengeance when they host Ernesto Valverde’s men. Massimiliano Allegri’s side will go through to the knockout stages with a win, while a draw could also be good enough, should Sporting fail to win. Barcelona, on the other hand, will qualify as group winners with a draw. It’s a longshot, but I’m backing Over 2.5 Goals at 8/10! Lastly, Sporting look to keep up the chase for qualification when they host Olympiacos on Wednesday night. The hosts will remain in contention for a top two finish if they win, while a draw will be good enough for third spot. Olympiacos have to win and hope Juventus lose to stay in contention for a top-two finish, anything but a victory and the Greek giants are out of Europe. With home advantage and much more to play for, Sporting are tipped to come out on top.